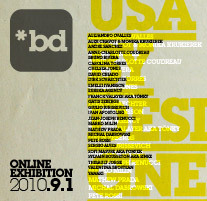 HUG United (tm) presents the online exhibition of USA BY DESIGNERS project featuring 26 contributors coming from 14 countries. An international artistic project whose aim is to unveil a multitude of images of USA from the inside and from the outside. Design as the expression of a cultural vision, a political vision or a simple and unposed feeling... Design and its diversity as a new way to catch USA. Unless otherwise indicated, all materials on these pages are copyrighted HUG United (tm). No part of these pages, either text, video or images may be used for any purpose other than personal use, unless explicit authorization. Therefore, reproduction, modification, storage in a retrieval system or retransmission, in any form or by any means, electronic, mechanical, or otherwise, for reasons other than personal use, is strictly prohibited without prior permission.